Haoliang is UN Assistant Secretary-General and the Assistant Administrator and Regional Director for the Regional Bureau for Asia and the Pacific in the United Nations Development Programme (UNDP). 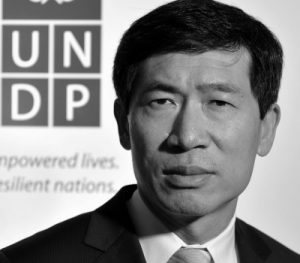 Haoliang joined UNDP in 1995 and has worked in the Asia and Pacific and Eastern Europe and the CIS Regions respectively. He has worked in UNDP New York headquarters (1997-99), Iran (2000-02), Timor-Leste (2002-04), Pakistan (2004-07) and served two terms in Kazakhstan (1995-97, 2007-10). Before taking the current position, he was UNDP Resident Representative and UN Resident Coordinator in Kazakhstan (2007-10) and Deputy Regional Director for Europe and the CIS in New York (2010-13). Before joining the United Nations, Mr. Xu worked as an assistant lecturer in Tongji, University in China, and was a computer-aided design engineer with Louis Berger International Inc. in the USA and South Korea. Haoliang is a national of the People’s Republic of China. He holds a Bachelor’s degree in Bridge Engineering from Tongji University, a Masters in Management Science from Stevens Institute of Technology and a Masters in International Affairs from Columbia University. He is fluent in English and Russian. Haoliang is married with one child.